We need your help. It is with great excitement that we invite you to sponsor a very special anniversary event. 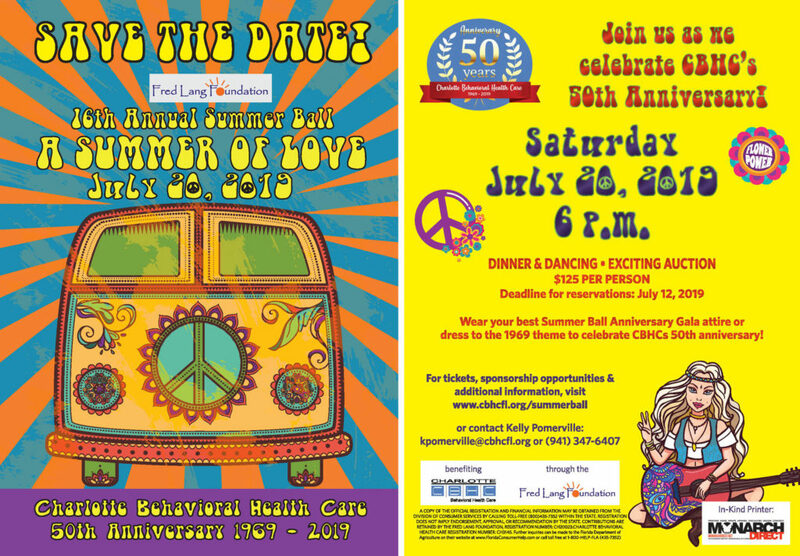 The Fred Lang Foundation 16th Annual Summer Ball: A Summer of Love celebrates the 50th Anniversary of Charlotte Behavioral Health Care (1969 – 2019). The event, presented by the Fred Lang Foundation on July 20, 2019, funds critical behavioral health services provided by Charlotte Behavioral Health Care (CBHC). CBHC is our area’s largest not-for-profit provider of community-based behavioral health care, offering a full range of mental health and substance use services. Florida currently ranks in the 49th percentile for mental health funding. Most recent statistics show that suicide is the 9th leading cause of death in Florida – in sports, being in the Top 10 is a good thing, but suicide is one thing that no one wishes to see in a Top 10 list. CBHC houses our area’s Crisis Stabilization Unit (where we unfortunately, have had children as young as 4 years old). Last year’s Summer Ball raised over $60,000, which went to provide urgent therapy and mental health care services for children in our community through CBHC’s Margo Lang Children Crisis Stabilization Unit as well as other mental health services provided within our community at CBHC. CBHC’s mission is to partner to instill hope, inspire growth, and embrace life. We deliver care that changes people’s lives – and often saves them. We are counting on you to partner with us in that mission. Without your help, CBHC would not be able to fill the gaps and expand its programs and services within our community.